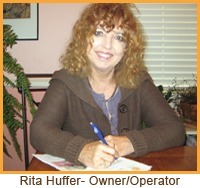 In the early 1990’s, Rita Huffer, owner/operator of Rita’s Care at Home LLC, began working as Director of Social Services at a skilled nursing facility in the Tennessee area where she grew up. She continued to work in skilled nursing facilities and nursing homes over the years, obtained her administrator’s license, and then began managing assisted living communities. During Rita’s 25 years working in long-term care, she experienced how painful it is for people to leave their homes and give up their way of life. She is committed to helping people stay independent and at home with a helping hand from her and her well-trained staff. The Philosophy of Rita and her staff is to enhance the quality of life for her clients by recognizing that each person is an individual with unique needs and abilities. We are committed to enriching lives by allowing clients to remain in the comfort of their own homes with a helping hand from our caring staff. We support independence and personal preference for how care is delivered. You tell us how you want it done. You decide when you get up, when you go to bed, when you eat, and so on.